How do you make the world's most boring dull-machines a bit more exciting? Carbon fiber wings, fart can exhaust and neon underglow? Nope, not even close. Try leaving them 100% stock, but make sure they are low optioned, manual transmission as original as possible...then, and only then will the buyers come running. It just so happens that two discount specials from appliance city just fell into our tips inbox...time for a comparison! If you had 3 large burning a hole in your pocket, would you pick the 1988 Camry or the 1983 Accord? The basic truth is that neither one of these cars will ever be remotely collectable, but that isn't the reason you should consider one. The real reason is that you can plop down less than the deposit on a new car and drive away with something that should run a few more 100k miles with only simple hand-tool maintenance. Up first is this 1983 Honda Accord 2-door offered for $2,600 in Kila, MT via craigslist (Tip from Oldsmobuick.) With 82k miles on the odometer, this one is the winner in terms of miles/use, but you gotta wonder, who only puts 2,600 miles per year on a low-option Accord? Did it rack those miles up like a normal commuter and then sit for a few years as indicated by the seller's diagnosis of carb issues? Finally, a seller who has only owned the car for a few months never leaves a nice taste in your mouth either. On the other hand, this thing looks really nice on the inside for a 31 year old commuter. Under the hood is a 1.8 liter Honda EK1 engine good for around 72 horsepower and mated to a 5-speed manual gearbox attached to the front wheels. Up next is that 1988 Toyota Camry offered for $3,000 in SF Bay Area via craigslist (Tip from Kaibeezy). This Camry has a decent number of miles on the odometer, but at 146k it is still young for a 2nd generation Camry. The key to this car is that it is being sold by the original owner, making it more desirable than something that has been passed around to a bunch of college kids. The US spec Camry could be had with an optional V6, but this car uses the 115 horsepower 3S-FE twin cam inline-4. It is a DOHC 16 valve engine equipped with fuel injection and mated to the front wheels via a 5-speed manual gearbox. If you have to drive a Camry, this is gonna be as fun as it gets. 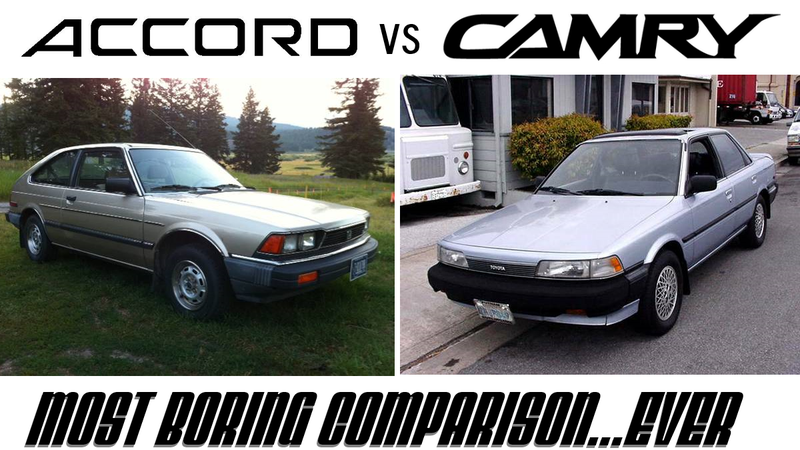 Originally posted as 3k: Battle Of The Bore: 1988 Camry vs 1983 Accord on Daily Turismo.